Roof Snake by PacTool International. Replace shingles more easily and accurately. Nail-slot feature aligns nail for proper 1" offset. Nail-pulling end replaces flat bar. Use in the installation of SkyLift Roof Riser Brackets. 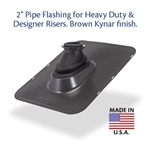 Lifetime Tool® & Building Products LLC’s Ultimate Pipe Flashing® employs a break-through design with a proprietary sealing method for plumbing vent pipes and other roof penetrations. Fits all Heavy Duty Risers. 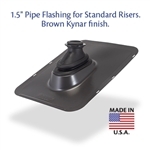 Lifetime Tool® & Building Products LLC’s Ultimate Pipe Flashing® employs a break-through design with a proprietary sealing method for plumbing vent pipes and other roof penetrations. Fits all Standard Duty Risers.